Eddie Andreini started flying in an L-2 Taylorcraft while still in high school at the age of 16. 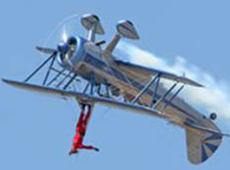 Today, he is a commercial instrument rated pilot and possesses an FAA aerobatic Ground-Level Waiver. Eddie has accumulated over 6000 hours flight time in a variety of diversified aircraft, including P-51's, Yak 55's, Pitts Specials and the Russian AN-2. His Super Stearman is a highly modified PR13D that started its life as a WWII primary trainer with a 225 hp Lycoming engine. Today it sports a modified 450 hp Pratt & Whitney with inverted fuel & oil systems. It has numerous modifications most of which are Eddie’s originals. From the unique canopy, 4 ailerons with spades, speed fairings and a wing smoke system which will handle a variety of pyrotechnic devices. Eddie has mastered Stearman performances to perfection! He is one of only a handful of pilots capable of extracting such a remarkable performance from the Stearman. His show is an astonishing array of twisting and tumbling maneuvers at speeds from 0-200 mph. This fast paced. Roaring and colorful show is an exciting event that leaves audiences asking for more. 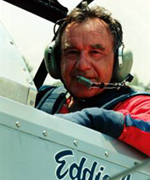 Eddie joined Thunderbolt Aerosystems in 2002 as Manager of Air Shows, responsible for the coordination of venue acquisition, preparation and planning for the Thunderman flight show events and its proliferation throughout the aeronautical show circuit.